The start of a new @rgpokerseries season means a new schedule theme. Welcome to the Old West! The start of a new RunGood Poker Series season means a new schedule theme, and this year is no different. The traveling tour will be embracing the Old West with cowboy boots and hats. Players are encouraged but not required to join in on the western wear. “Definitely come play in whatever you are comfortable wearing but if you feel like grabbing a pair of boots and a hat, know that the ambassadors and RG staff will be right there with ya.” – Tana Karn, Founder and President of RunGood. To cement the season’s theme, Championship Belt Buckles were custom crafted for event winners. Each stop holds a minimum of two preliminary events before the Main Event giving players multiple chances to take home a piece. 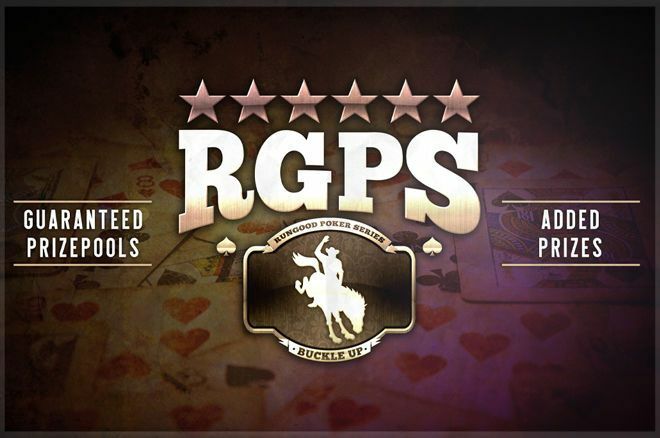 The opening event always sports a $135 buy-in with bounty prizes on special guests ranging from $1,000 CASH to RG Apparel. In addition to this year’s new theme, the tour will be trying out Big Blind Ante structures for their non-satellite tournaments. The structure is designed to increase the efficiency of the tournament to let players see more hands. Popularity of the structure has been growing. Particularly after many venues in Vegas during the summer have been introducing it to players. “We want to stay ahead of the curve and give our players what’s new and exciting out there.” – Justin Gardenhire, RunGood Ambassador. 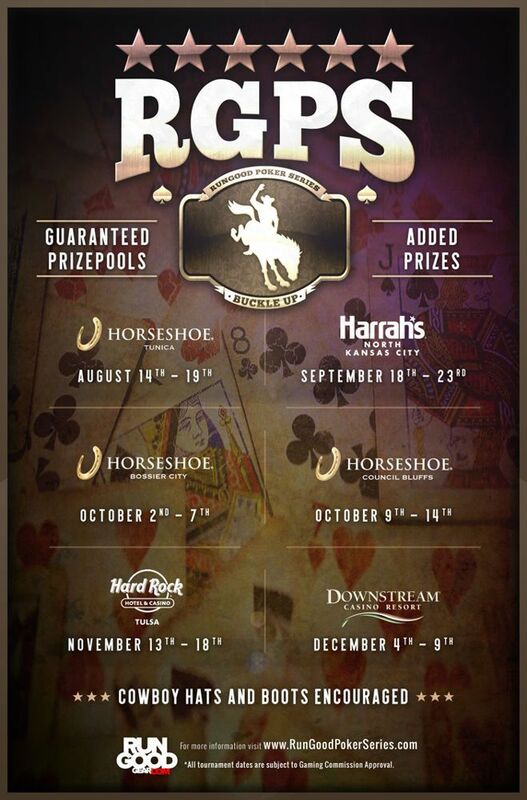 The first stop will be at Horseshoe Tunica August 14th – 19th, the venue currently holds the record for the biggest fields for each non-satellite event in the history of the series. 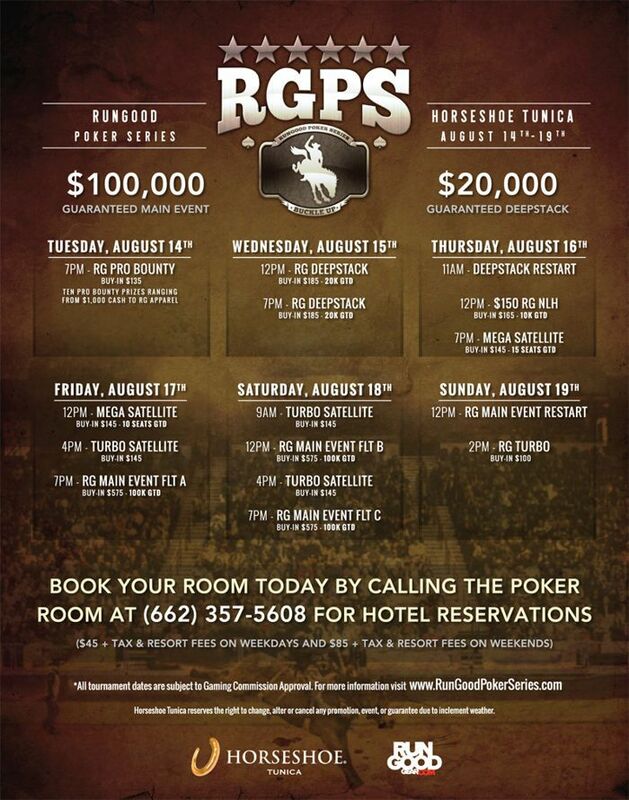 To learn more about future stops visit rungoodpokerseries.com.